The Smithsonian’s Most Popular Museum! 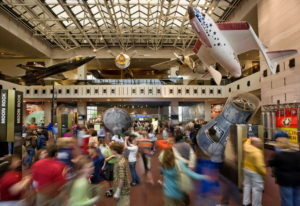 The National Air and Space Museum in Washington, DC has thousands of objects on display, including the 1903 Wright Flyer, Charles Lindbergh’s Spirit of St. Louis, the Apollo 11 Command Module Columbia, and a lunar rock you can touch. In addition to our exhibition galleries, you may want to visit the Albert Einstein Planetarium, Lockheed Martin IMAX® Theater, and the Public Observatory on the east terrace. After leaving the Air and Space Museum in 2012, the USS Enterprise Studio Model has returned after a comprehensive renovation and cleaning. Smithsonian Photo. On July 1, 2016 the National Air and Space Museum celebrated the 40th anniversary of its flagship building in Washington, DC. 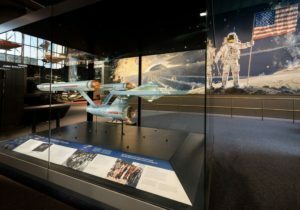 In addition to reveling the newly renovated Boeing Milestones of Flight Hall, the main entrance and lobby of the museum, the Studio Model of the USS Enterprise from the original Star Trek television show returned to the museum. The model was removed from display in 2012 for a comprehensive renovation, and cleaning. The model is now on display in the Boeing Milestones of Flight Hall opposite the McCall mural on the Independence Avenue side (opposite the National Mall). The museum is open from 10:00 am to 5:30 pm (10:00 am to 7:30 pm July 5 – September 5, 2016). And is closed on December 25th. Admission is free. There is not a dedicated parking facility for any of the Smithsonian Museums. Street side parking is available along the roadways running in front of the museums and crossing the National Mall. Parking is first-come-first-served and fills quickly and early. There are commercial parking structures adjacent to the mall. Floor Plans and Guides for the Udvar-Hazy Center can be found at http://airandspace.si.edu/visit/museum-dc/floor-plan-guides. Or, open a copy of the floor plan guide from http://airandspace.si.edu/sites/default/files/dc-english.pdf.